Galerie Perrotin in Hong Kong is currently presenting a solo exhibition by French sculptor, photographer and painter Xavier Veilhan, the first exhibition by the artist to focus exclusively on his mobiles. 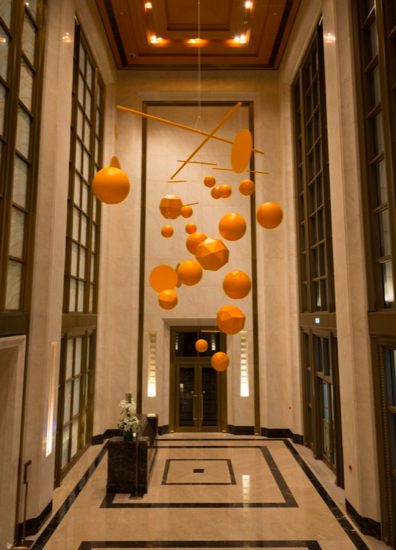 Combining a selection of past work with a series of new installations created specifically for the exhibition, Veilhan explores the mobile as a fluid continuation of his work on the intersections of geometric form and three dimensional space. Delving into the possibilities for artistic practice with a minimum of parameters and elements, much Veilhan’s work explores the use of repetition and variation, using and manipulating simple forms to create complex sculptural works that stand as a testament to both their subject matter and construction. 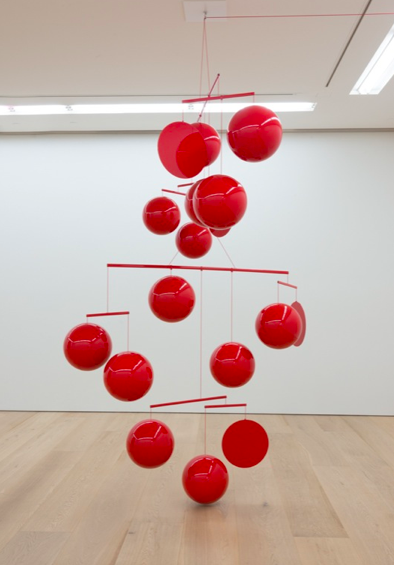 Veilhan’s mobiles are a continuation of this practice. 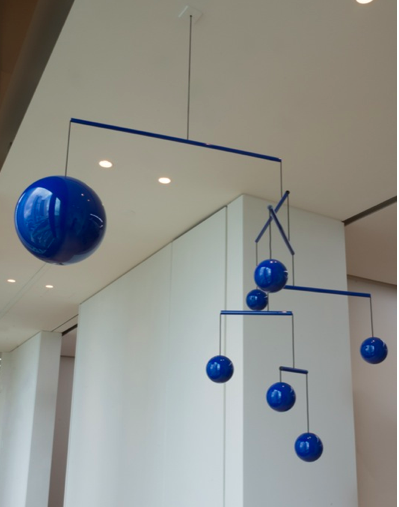 Taking cues from an artistic tradition begun by American Alexander Calder, Veilhan’s work with mobiles embraces not only the concepts of flux and perception that Calder’s work raised, but also brings a new focus on the materials themselves into play. 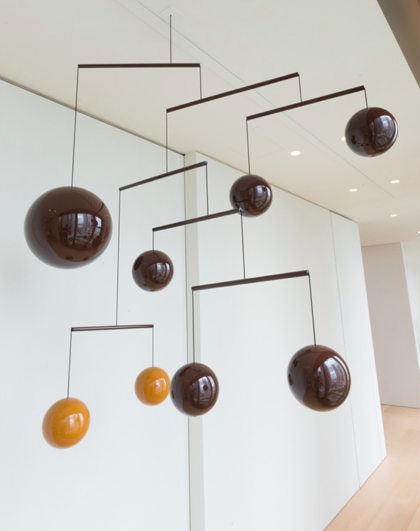 Distilling the elements of his mobiles down to block forms, orbs and graphite poles, the work embraces a new focus on shape, and the infinite permutations that spring from these minimal elements. 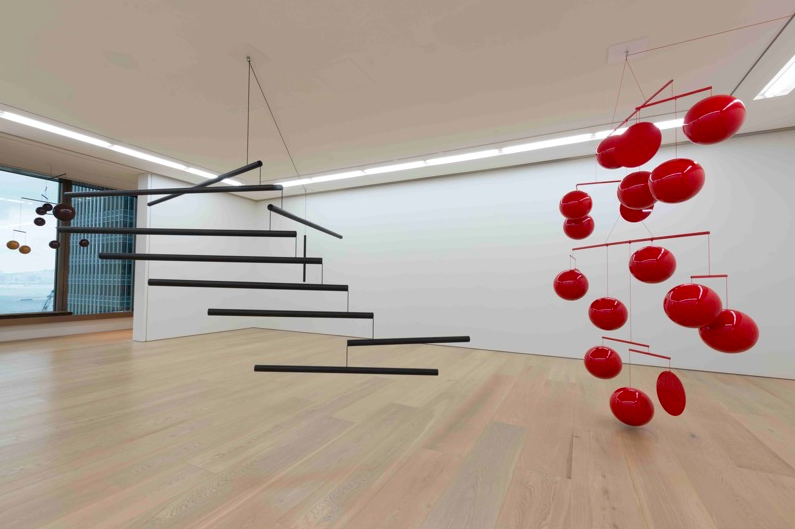 Alongside some of the larger works on view, including Veilhan’s enormous Hatfield Mobile, originally commissioned for the Hatfield House in the United Kingdom, the artist has also created a number of works made with the exhibition space of Galerie Perrotin in mind. This Hong Kong Mobile series is the most recent entry into Veilhan’s ongoing mobile exhibition, and is inserted throughout the gallery space, using its tight corners and hallways as the framework for Veilhan’s artistic intrusions. Taking the endless rotations and variations of the mobile as his starting point, Veilhan uses his works on view for a broader exploration of movement and form within a three-dimensional space. His simple pieces combine into a twisting, swirling assemblages, each piece in conversation with its adjacent parts, set in a near-constant shifting of position and relation. In one work, Orchestra, Veilhan’s columns of black graphite turn inward on themselves, oscillating between spiraling helix forms and sheer faces. In other, smaller works, Veilhan’s work plays at the delicate balance of weights throughout his work. 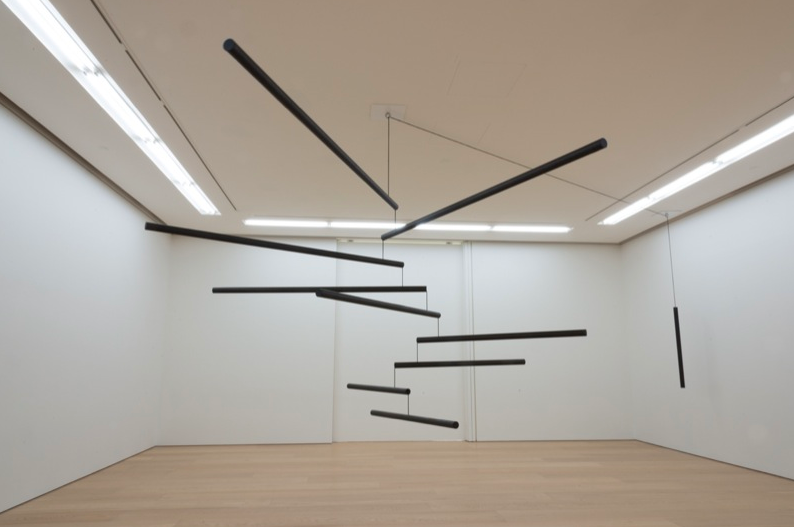 In Hong Kong Mobile no˚7, he plays at the division of weights at each subsequent level of the work, dividing each layer of his mobile against the layer above it, creating an equilibrium in forms that is obscured as the work rotates. An understated inquiry into the raw behaviors of form in space, Xavier Veilhan’s installation at Gelrie Perrotin is an intriguing entry into the artist’s already broad body of work. Using the mobile as a canvas for his own brand of minimalism, Veilhan welcomes a new perspective into the form as a sum of its parts. His show is on view until June 7th. This entry was posted on Sunday, July 7th, 2013 at 12:31 am	and is filed under Art News. You can follow any responses to this entry through the RSS 2.0 feed. You can leave a response, or trackback from your own site.